“3DP=STARTUPS=JOBS”—21st C. eCottage Industries Are Launching From 3D Printers On Kitchen Tables, In Dorm Rooms & On Garage Benches…AND MakerBot Is Strategizing Means To Assure Those Startups Build On Its Brand! MakerBot CEO Bre Pettis & SUNY New Paltz President Donald Christian Exchange With Press During The News Conference At The Inauguration Of The World’s First “MakerBot Innovation Center” At SUNY New Paltz, 11 February 2014. 3DP is the 4th Disruptor! In order of debut, these four landmarks of our Digital Age are: (1) PC; (2) Internet; (3) Social Media; (4) 3DP. Our 4th Disruptor is really about atoms not bits. Atoms make things; digits make thoughts. Disruptors (1) thru (3) are Digital; 3DP is Neo-Analog! Thus, the 3DP Revolution is fundamentally different from the first three disruptions of the last 40 years at the beginning of our Digital Age. Our Fourth Disruptor promises to help re-industrialize and rejuvenate American manufacturing—by “new-shoring” it IN the United States. 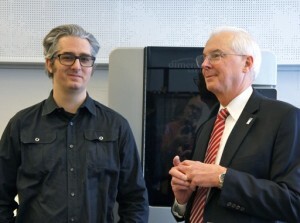 MakerBot launched its first “MakerBot Innovation Center” at a university. BUT, the company’s corporate goals are just as much about the “now!” betterment of private industry—and perhaps more so. In the world of business, MakerBot seeks to employ its 3DP means to enhance hyper-productive knowledge, instruments of innovation and change-making techniques. 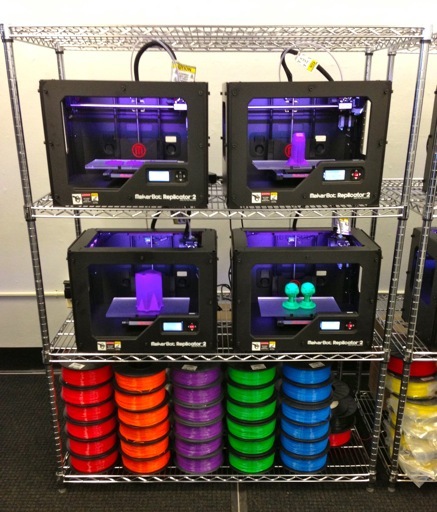 In the strategic overview, MakerBot has a greater stake in the commercial marketplace than the educational. Businesses—startups and ramp-ups—can provide quicker ROI (with equipment purchases tomorrow). Educational institutions, conversely, will take longer to produce a return on the medium and long bureaucratic marketing and sales—of MakerBot Academies and Innovation Centers to high schools and colleges respectively. Seeking to buttress educational institutions and the “making” careers of future graduates is strategically important to MakerBot. After all: hearts and minds make buying decisions. And, brand loyalty—so engendered—could make for lifetime-customers. It’s just that MakerBot will have to strike the right balance between the different ROI profiles of these two market segments. The quick and mercurial of business and the long-term buying profile of educational institutions. Nancy Zimpher, Chancellor of the State University of New York, Joins The Public Ribbon-Cutting By Video Presentation At The “MakerBot Innovation Center” Debut, SUNY New Paltz, 11 Feb 2014. MakerBot’s official media releases around the debut of the Innovation Center doesn’t specifically tout jobs as an “output” of its Centers” initiative. But, job-generation is implicit in the message the company is delivering to the marketplace. When we kicked off our 3DP Media startup in May of 2013, we showcased “3DP=Jobs” as one of our official mantras. And, we still do! The longform of this commercial chant is “3DP=Startups & Ramp-Ups=Jobs.” As we state in this post’s headline, 3DP’s creative making—by amateur and professional Techreatives—is the well-spring for our 21st Century’s eCottage Industries. And, the best job-making startups will probably arise from totally naive, newbie makers—who don’t know enough to know what can’t be done. Those who can restart their creativity in the now-software and hardware modulated “playrooms” of a (virtual) childhood recaptured—where multi-media mashups, serial start-overs, laughing lunacies and sheer delight in the manipulation of 3D fun—are likely to be the most successful of the (3DP-empowered) entrepreneurs of our national makeover. 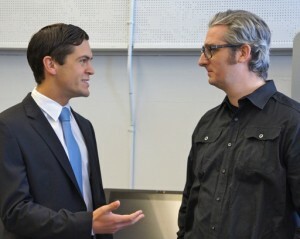 Sean Eldridge, President of Hudson River Ventures & a Founder/Benefactor of the Hudson Valley Advanced Manufacturing Center at SUNY New Paltz, exchanges with Bre Pettis, CEO of MakerBot, and keynoter at the the Grand Opening Celebration at the “MakerBot Innovation Center” at SUNY New Paltz, 11 Feb 2014. One solution to this dilemma—of scaling and extending the concept and reality of Innovation Centers out into each local-business community nationwide—is to partner and collaborate with ALL the hyper-local players as a TEAM of community interests. What I’ve already started to call the Collaborative Home-Team in posts such as these. 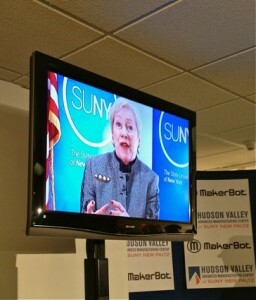 Signage at the MakerBot Innovation Center Opening Ceremony, 11 February 2014, SUNY New Paltz, showing some of the Team of local collaborators who helped realize this break-through project. Local or regional venture-capital firms. These organizations have common and commonweal interests that they can naturally aggregate to advance change-agents, populations, communities, industries and more. The catalyst can be win/win initiatives like “MakerBot Innovation Centers.” BUT, the on-driving engine must be—at the least—an engaged and energetic leader (or cadre of true believers) with vision and drive to help bring such Teams together for both commerce and common-good. One Response to “3DP=STARTUPS=JOBS”—21st C. eCottage Industries Are Launching From 3D Printers On Kitchen Tables, In Dorm Rooms & On Garage Benches…AND MakerBot Is Strategizing Means To Assure Those Startups Build On Its Brand!